. What is the actual production of the concrete mixing plant? Let’s take a look today. We know that the theoretical production volume of each type of concrete mixing plant equipment is different from the actual production volume. Especially when the mixing station configuration is different, the theoretical production volume will be larger than the actual production volume. HZS25 concrete mixing plant is a simple mixing station configuration mode. The theoretical production capacity is 25m3/h, and the actual production volume is about 15-20 cubic meters per hour. HZS35 concrete mixing plant is also a simple mixing station configuration. The theoretical production capacity is 35m3/h, and the actual production capacity is about 25m3/h. HZS50 concrete mixing plant is a small and medium concrete mixing station. The theoretical production capacity is 50m3/h, and the actual production volume is about 35-40m3. HZS60 concrete mixing plant is a national standard configuration, equipped with belt feeding and centralized control system. The theoretical production capacity is 60m3/h, and the actual production capacity is 55-60m3. 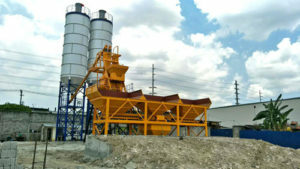 HZS75 concrete mixing plant n is a mixing station for medium-sized projects. It adopts JS1500 main engine, crawler feeding and centralized control. The theoretical production capacity is 75m3/h, and the actual production capacity is about 70 cubic meters. HZS120 concrete mixing plant , national standard configuration, theoretical production capacity is 120m3 / h, the actual production capacity is 115-120m3. HZS150 concrete mixing plant , national standard configuration, the theoretical production capacity is 150m3 / h, the actual production capacity is 145-150m3. HZS180concrete mixing plant , national standard configuration, the theoretical production capacity is 180m3 / h, the actual production capacity is 175-180m3.